A few days ago, I posted a quick guide about upgrade order for both farming and Clan Wars at a time but these days I also have received couples of questions about upgrade priority for players who are focusing on just Clan Wars. After reading the suggestion from wuxbustah8, I’ve just decided to write this little guide! 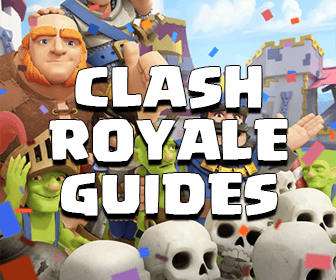 Small note: This guide is based on the Clan War matchmaking system in game and for optimizing your base weight, help you always can 3 stars the enemy base which has the same position as you (your mirror in Clan Wars). I think we all know why we should upgrade these 3 buildings at first. Upgrading our current troops to their new max levels should always be the highest priority. By upgrading 2 Spell Factories, you can bring more and new spells into the attacks, especially very essential for Clan Wars, where just one more Spell can change everything. At Town Hall 8, you can get the Poison Spell, which helps you deal with the Clan troops much easier, and the Earthquake Spell, which helps you finish off most Town Hall 8 war base with the Zapquake Combo. Who doesn’t like new impressive weapon for both farming and Clan Wars? Get the level 5 Queen If you are at TH9 and the level 5 Barbarian King If you are at TH7 as soon as possible. 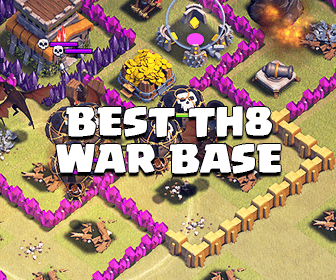 For TH7 players, we have an individual guide about farming DE at Town Hall 7 at here. The more troops you have, the much stronger your army is. Get them done as soon as possible. Undoubtable, Clan Castle is the strongest defensive building in Clash of Clans. Moreover, with high level Clan Castle, you can bring more strong units for raiding, especially the troops you haven’t owned yet. After upgrading all those above, I think you should start working on your Heroes. Because this is a long term job so just do it whenever you have the opportunity. Lots of players like upgrading Barbarian King before the Archer Queen and vice versa because he can take damage and protect the Archer Queen. Let’s discuss about this late. For now, just upgrade the Hero you like and follow this guide for upgrading your Heroes effectively. You don’t need to upgrade your walls to their maximum level at the previous Town Hall, but you should upgrade them to a certain level which can’t be destroyed by just 1 Wall Breaker (see more at Wall Breakers Vs. Walls). Mix them up, upgrade your walls when you have loot and also want to keep your Builder free. Build these new stuffs If you’ve just hit Town Hall 8/9 and upgrade them to the level of other current ones. With the 3rd Air Defense at Town Hall 8, you don’t need to worry about Dragon attacks anymore. Giant Bombs are critical at all Town Hall levels for dealing with either Hog Rider attacks or Barch variations. Clash of Clans is not just about attacking and defending, non-defensive buildings also play a role in game. IMO we should upgrade Dark Elixir Drills at first because the amount of DE we need it is unlimited. In addition, high level Dark Elixir Drills have an insane producing speed. By having them, you can upgrade your troops much easier. While your Drills are being upgraded, the next building you should upgrade is Barrack. With new troops, especially at TH7 (Dragons) and TH9 (Lava Hound), you can have new stronger attack strategies and have lots of advantages in both Clan Wars and farming. After that, you can start working on Storages and other Collectors. You can either upgrade trap to the level as other ones’ at last or mix them with the Collectors/Storages, which suits you the best. Upgrade them when you don’t want to hoard too much loot for a long time. Upgrade them to the max levels at the previous Town Hall, like other current defenses. You can do this and upgrade your traps at the same time. Remember: Just upgrade them to the previous TH max level. This depends on what loot you focus on. Let’s assume that we are normal players and focus on both 3 resources at the same time. If you want to get 3 stars from the base which has the same progression as you, you need to be maxed out your troops at first. Air Defenses: The best defensive building which help you survive all air attacks, which are always extremely strong at all Town Hall levels. Hidden Teslas: Undoubtable, Hidden Teslas work amazing against P.E.K.K.As and pretty nice against air attacks. Also, they can work as traps and give the enemies difficulty by luring their tankers for pathing. Because GoWiPe attacks are pretty popular, I’d like to place Hidden Teslas at the second position at this upgrade order. Archer Towers/Wizard Towers/Cannons: I’d like to recommend upgrading Archer Towers and Wizard Towers before Cannons as they have a nice attack range and also can hit flying units. X-Bows /Inferno Towers: Deal damage to the enemies with insane DPS and attack speed. The reason we shouldn’t upgrade them sooner because they can hurt your base weight so bad. Upgrading them while you are working one the last upgrade of your War troops. Mortars/Air Sweeper/Traps: Although Mortars are really great for farming but they are the worst choice for Clan Wars. Assuming that your troops are maxed from the previous TH level. As this page is just for Clan Wars, so these recommendations is for the quickest way to get 3 stars in Clan Wars. Feel free to upgrade your farming troops at fist as needed. All troops above are mentioned as just for Clan Wars, after upgrading them, you can upgrade which troops you like. If you have any suggestion/recommendation, don’t hesitate to show us your opinion!